2 bedroom apartment, sleeps 4 in Pitlochry, just 5 mins walk from the High St.
Park Gardens is a self catering 2 bedroom apartment which forms part of a stone built Victorian house. It is situated in a quiet and peaceful location, 5 mins from the town centre with access to all local amenities. There are quaint shops, restaurants and cafes, a boating lake and just across the river is the world famous Festival Theatre, Art Galleries, 'Explorer's Garden', Fish Ladder, Dam and riverside cafes. Maintained to a very high standard, this family home provides warm, comfortable accommodation all the year round. There is gas CH, double glazing, 2 bedrooms, a large lounge and spacious dining kitchen. The traditional lounge has 3 settees, tv, dvd&cd players, PS2, DS and a wide selection of programmes and games. The well equipped dining kitchen has all modern facilities incl fridge freezer, washing machine & drier, microwave, espresso maker, hob and double oven. The Atholl Palace Hotel, a short walk away, is set in magnificent grounds and has a small but fascinating museum; Blair Castle provides an excellent day out.-the ancient seat of the Dukes and Earls of Atholl houses a great display of arms and armour, as well as extensive collections of porcelain, paintings and period furniture. Nearby Loch Faskally and Killiecrankie offer a wide variety of outdoor activities including walking, sailing,fishing, canoeing and a number of adventure sports. Whisky Galore: Enjoy a complimentary 'wee dram' when you book a tour with Edradour, a short walk from the house. Edradour is the smallest distillery in Scotland and is the last original 'farm' distillery in Perthshire. Book a show at Pitlochry Festival Theatre, the ‘Theatre in the Hills’, founded in 1951. 'It’s a unique phenomenon, no other British theatre attempts this extraordinary turnover of plays'. Scotland On Sunday. Follow in the footsteps of the Scottish Plant Hunters; try your hand at willow weaving or learn new skills by visiting the Explorers Garden, just across the river.The garden is open from April 1st to November 2nd.Opening hours are as follows: Everyday 10am to 5pm.Last entry to garden: 4.30pm. Walk! Walk! Walk! There are over thirty way-marked walks in the local area-details in the house, complete with ordance survey maps or down the road at our excellent Tourist Centre. Remember to try the 'Pitlochry Historic Trail' -a short 2 mile walk back in time. Make sure you take in Queens View – the favourite viewpoint loved by Queen Victoria, who regularly visited highland Perthshire! Park Gardens is a double upper flat with gas fired central heating, double glazing and fitted carpets throughout. There are two bedrooms and bathroom on the first floor. The ground floor comprises a large dining kitchen and warm comfortable lounge. The dining kitchen has all modern amenities and seating for 4 persons. The traditional lounge has a period style fireplace with flame effect gas fire, 3 sofas and attractive Victorian style furniture. There is a small pretty garden, (to the right of the property as you face it) accessed from the road. BBQ and bikes are in the first shed opposite the garden gate. Details are in the house folder. This was a perfect location for our family trip. The house was within walking distance to town. The street was very quiet. The owner, Pat, was easy to reach and provided quick responses to my correspondence. I would recommend this place for a relaxing stay in Pitlochry. The manager Pat is awesome. Great communication and lovely with it. We had a lovely stay over New Year with our son and his partner. The cottage was very clean and comfortable with everything required for our stay, and was in a very quiet location only 5 minutes walk to the Main Street and local amenities. We enjoyed the Prosecco and shortbread left for our arrival, which was a nice touch. Pat was the perfect hostess with excellent communication before and after our arrival at the cottage. 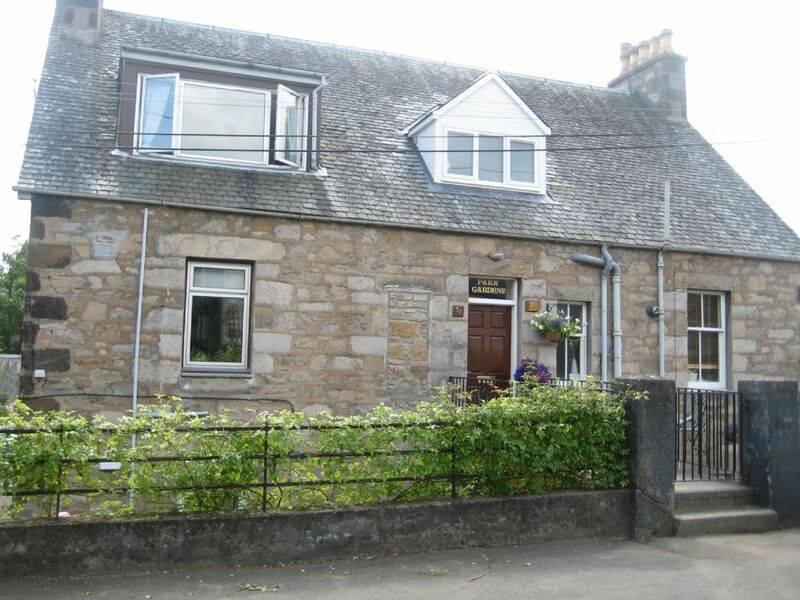 Very nice property in Pitlochry. Everything about this property was of a very high standard. The owner has to be a born organiser, as everything you needed was available. I would certainly use this property again.Many thanks Pat. We spent 3 nights in Pitlochry and found the 2 bedroom home roomy and very well stocked. We arrived to some shortbreads and a bottle of Prosecco which was a lovely touch. The bathroom was new and the shower had excellent pressure. We loved the huge towels as well. Both the washer andryer worked easily and the WIFI was strong. Parking on the street was no problem at all. It was a short walk to the Coop, butcher's shop and just to shop along the Main Street . It was perfect, very quiet and had a very nice garden to enjoy some wine too. Thank you so much for your kind words here Charles and thank you for taking the time to send a lovely text.I'm so glad you and your party enjoyed your stay. Pitlochry and Highland Perthshire is one of the most scenic parts of Scotland with many lochs, rivers and rugged hilltops. It has a wealth of places to visit-Blair Castle, ancient home to the Dukes of Atholl; Queen's View, the famous beauty spot; glorious glens with stunning scenery abundant with wildlife; and in Pitlochry town itself, the world famous Festival Theatre, Salmon Ladder,whiskey distillieries and a wide array of shops, restaurants and cafes. There are over 40 miles of marked wallking trails. Annual events and festivals include the NewYear's Day Street Party, Etape Caledonia,Pitlochry Highland Games, the Enchanted Forest,Pitlochry Autumn Festival,Perthshire Amber Festival and the Winter Words Festival. Activities include bird watching, hill walking, climbing, cycling, quad biking,sailing, fishing, white water rafting,gorge walking and of course, golf. There's something for all the family within a stone's throw of your holiday home! Golf: The beautiful countryside of Perthshire, at the very heart of Scotland is the pefect place for a golfing break. More Golf: You'll find another 40 superb courses in the area-all highly accessible, great value-for-money and with spectacular scenery. For more details go to: www.perthshire.co.uk , click on 'search' and type in 'Golf' . The world famous Gleneagles courses (where the Ryder Cup will feature in 2014) is a 30 min drive away; Blair Atholl 15 mins; Dunkeld 18 mins; Blairgowie 20 mins; Aberfeldy 25 mins; Kenmore-30 mins; Spittal of Glenshee 30 mins; and there are four courses at Alyth just 45 mins from the house. £50 deposit to confirm bookings with balance of rental due 6 weeks prior to arrival. Arrival and Departure:- arrival from 4pm, departure by 10am. Minimum charge:£200. Minimum stay: 2 nights at the weekend or 3 nights midweek.